When you learn about sewing tools, you learn that many are sharp. From the time our parents hand us scissors for the first time, we are told to be careful around them. We are taught to hand them to someone with our hand around the blades, extending the handle to the recipient. 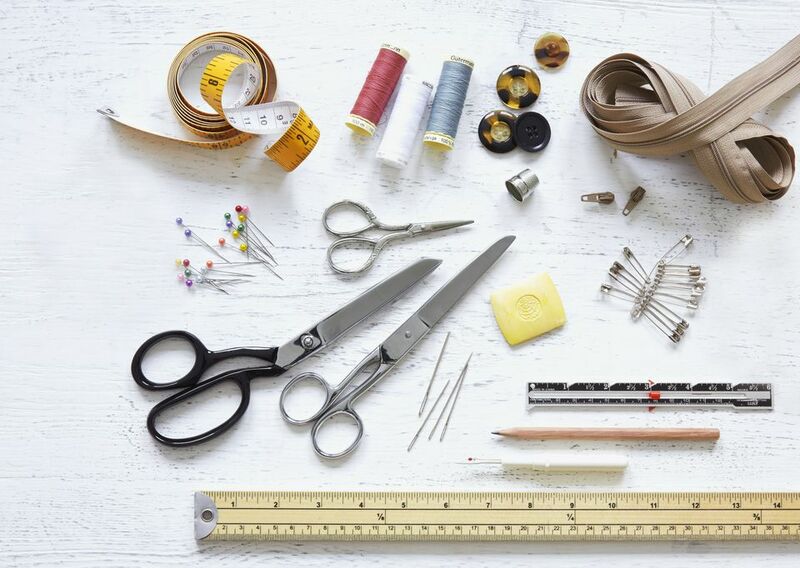 Other sewing tools, like pins and seam rippers, can do damage just as a pair of scissors can but no one has ever developed "rules" for those simple sewing notions. Common sense has to come in to play when handling sharp tools. Never aim a seam ripper at your body or at someone else. Always work with the point pointing away from your body and keep your hands out of the path of sharp tools. Never poke the point of pins into your skin. A pinprick isn't usually an earth-shattering event but any cut or puncture can get infected and blood is a nasty stain on fabric. The first sewing equipment didn't include sewing machines. Hand sewing was the way things were sewn. Given the nature of hand sewing, thimbles were probably the very first sewing safety tool ever invented. Rotary cutting equipment is a wonderful way to assure you are cutting accurate squares and angles. Rotary cutters are fast and the sharper the blade, the faster you will get your fabric cut out and ready to sew. BUT.. wait! Take your time! Get your ruler lined up and then stop! Make sure your fingers are out of the path of the cutter! Just as fast as that rotary cutter cuts through fabric, it will cut through skin and fingernails. A finger near the edge of the rotary ruler will lose a piece of the finger. Not all rotary cutter blades automatically retract when you are not using the cutter. Be sure the blade is covered and locked, if possible, to prevent accidents! Many classes have a "fine" for leaving a rotary cutter blade unprotected. Consider fining yourself and set up a coin jar to place your fine. It will be a pain to stop and pay your self a fine that you will eventually spend on a new sewing tool, but it will reinforce the fact that you HAVE to remain safe! Cut resistant gloves are an excellent investment for safety. If you are teaching children consider the investment in safety gloves or using the rotary rulers to mark lines and cutting the lines with scissors rather than a rotary cutter. A dining room table is one of the most popular locations for cutting out a sewing pattern. It's a wonderful flat surface at a reasonable height to work. BUT... no one is going to be happy if straight pins have dug in scratches or scissor blades scratched the table. Of course, everyone would love to have a cutting table devoted just to cutting out fabric but not everyone has the room or budget for a cutting table. You can avoid scratching the table by crawling around on the floor but that is far from a comfortable way to work. You could line the table with cardboard to protect it but storing pieces of cardboard and having the cardboard be a flat surface is not always possible. An expensive dining room set may have table pads but they are not designed for cutting and pinpricks. An inexpensive solution is a portable fabric cutting board that folds up compactly for storage, has a grid and various cutting guides, provides a continuous flat surface and protects the table for as little as $25. A sewing machine is a fast way to form stitches... a lot faster than hand sewing BUT it can also be a lot more dangerous than hand sewing. Learning to properly operate a sewing machine is the place to start to achieve excellent results but beyond operating a sewing machine, safety equipment is available. At no time should your fingers be near the moving sewing machine needle! it is easy to be distracted and lose track of where your fingers are in relation to the moving needle. If a child is learning to sew, I strongly recommend contacting the machine manufacturer or a local sewing machine dealer to obtain a needle guard. A needle guard provides a barrier to prevent fingers from wandering into the path of the sewing machine needle. Needle guards come in many different shapes and sizes. The needle guard shown in this photo is a very inclusive cover to protect fingers from the barbed needles on a Janome Xpression Needle Felting Machine. To obtain a needle guard that will work best with your sewing machine, your local dealer or the machine manufacturer is your best resource.